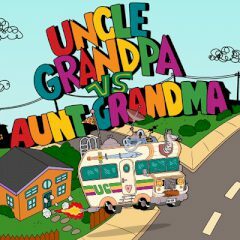 Are you ready to compare Uncle Grandpa vs Aunt Grandma? Take control of the vehicle, dodge the junk on the street and collect the butter for the boost! Uncle Grandpa is ready to defeat Aunt Grandma in this street competition. Just drive your vehicle along the street and avoid the junk and pedestrians. Any hit will decrease your speed significantly, so you need to drive safely and collect butter to boost your car to the victory! Play Uncle Grandpa Rock! Paper! Tummy! Uncle Grandpa Rock! Paper! Tummy!